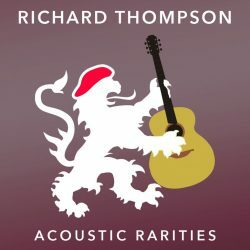 Coming a mere 2 months after his other 2017 release ‘Acoustic Classics Vol II’, Richard Thompson has released his collection of Acoustic Rarities made up of some unreleased acoustic recordings, songs that have only previously been released by other artists, tracks taken from both his vast body of solo work and some acoustic re-imaginations from his Fairport Convention days. Fans of Thompson know that he is no stranger to both hard work and producing consistent, quality content having been in the business some 40 years and Acoustic Rarities, of course, is of no exception. With countless accreditation’s and awards, Richard Thompson is widely accepted as a legendary songwriter and having recently been revered by Rolling Stone as one of the Top 20 Guitarists of all time, it isn’t surprising that Acoustic Rarities contains some fantastic songs and even better playing kicking things off with the previously unreleased What If? which is an electric, energetic performance and a great way to open the collection which leads straight into the melancholy They Tore The Hippodrome Down led by a hypnotic guitar line showing a complete different side of the artist, and demonstrating incredible versatility in the songwriting on offer here. Rainbow Over The Hill previously released by the Albion Band has an almost Greensleeves, medieval feel with it’s folk melodies and the distinctive vocal of Richard Thompson and whilst not too different to the Albion Band version, it’s an excellent inclusion to allow insight into the songwriting process and how the song was developed which is also applicable to the subsequent track Never Again made recognisable by Richard & Linda Thompson. The second half of the fourteen track LP largely focuses on reimaginings of older songs from Thompson’s back catalogue interspersed with more unreleased songs and it is a pleasure to take a trip down memory lane and hear the songs in a stripped back form to focus on the true talent in the songwriting and to be treated to some less familiar songs. Stand out tracks in the latter half of the record come in the form of Poor Ditching Boy from his first solo release ‘Henry The Human Fly’ and two tracks from Fairport Convention’s ‘Full House’ album – Sloth and Poor Will and the Jolly Hangman, both of which again testify to the quality in the songwriting but also give the song new life as Richard Thompson has improved both as a vocalist and a musician and the newer recordings allow that experience and talent to shine through to the forefront. For fans of both Fairport Convention, Richard Thompson’s solo work or fans of folk music in general, Acoustic Rarities is a great collection of songs from one of the UK’s finest singer songwriters and is worth picking up to hear both the new music on offer here and the nostalgia-laden reimaginings of some of his older work. A great addition to his already impressive, and extensive, back catalogue.